The rewards of offering a laminitis treatment product so helpful to horses are plentiful, but none so much as the relief laminitic horses (and their owners) receive by feeding The Perfect Horse®. Providing needed micronutrients can help turn the tide of Equine Laminitis before it becomes a deadly disease. The longer the condition exists, the more chance of further complications such as abscessing, which can lead to pathways for bacteria to enter the inner hoof creating infection and further complicating the diagnosis. As a working farrier, Wayne Blevins saw that feeding the raw micronutrients found in AFA, made favorable changes to connective tissue as illustrated by the graphic contained in Rowdy’s story. Reports from many other owners, farriers, and veterinarians, have consistently shown the same results. In the before picture the coffin bone had sunk to the point that there was little that any farrier could do other than try to protect it from getting worse. 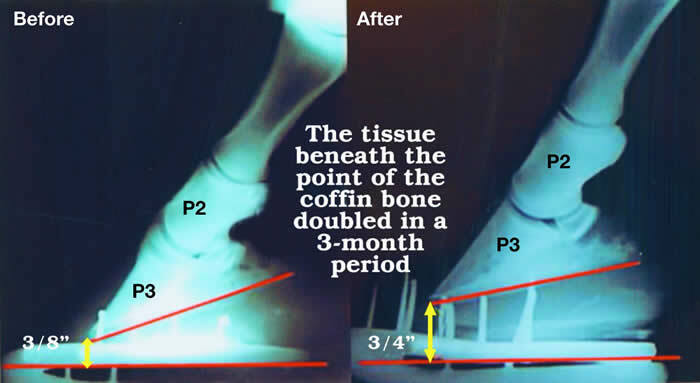 Three months later, after feeding The Perfect Horse®, there was enough sole growth below the P3 that a rocker toe shoe and frog pad could be applied, putting the entire bone structure in proper alignment. To conquer the devastating effects of laminitis takes good nutrition, good farrier technique, and commitment of the horse owner. Nutrition we can help with. Others formulate mixtures of vitamins that are not absorbable and pass through the animal. When that doesn’t do the job they make a second product that is called extra strength but only passes through more of the unassimilable formulation. AFA is believed to be up to 97% assimilable by the body and The Perfect Horse® products are guaranteed to make a difference or your money back. Wayne recommends feeding the raw E3Live FOR HORSES for the first 48 days (2 ounces/day) and then switch to the more affordable E3AFA FOR HORSES (2Tbl /day). 1 year guarantee that you will see a difference or your money for the products will be refunded. Once the laminitis has been put in check, a minimum feeding of The Perfect Horse® will continue to provide micronutrients on a daily basis. I did some research on the internet and found the product E3 live for horses. Decided to try this as I didn't really have anything to lose. The vet came to see how my horse was doing and could not believe how well she was doing!! He was totally in shock!! In six weeks she was up and moving around. Walking was not a problem for her. And yesterday she was actually running in the corral and kicking up her heels! !